Can Auckland lead the world? Last week I took a look at how public transport ridership in Auckland might grow over the next decade, if it continues current strong growth rates and lines up with the transport modelling predictions in ATAP. This would be quite a turnaround from 10-20 years ago, when public transport use was in freefall and Auckland was seen a one of the most car dependent, sprawled cities in the world. A world-class rail network anchored by the City Rail Link, electrification extended to Pukekohe, 36 more trains supporting higher frequencies, and hopefully fast and frequent passenger trains to Hamilton and beyond. A new light-rail network linking the city to the Airport and the city to the Northwest. We have a Unitary Plan that provides for large-scale intensification across much of the city, and largely gets rid of perverse planning rules (like minimum parking requirements) that make quality intensification nearly impossible. All these gains have been long and often painful processes. Some of this pain is still happening, particularly when it comes to providing safe cycling infrastructure. But each battle has ultimately been won. Equally importantly, city destroying motorway projects have been cancelled or indefinitely delayed. Progress is being made, at an increasingly fast rate. So what is Auckland doing right? Why is Auckland able to come up with such good transport plans, a Unitary Plan that allows for growth far more than most plans do, a comprehensive (although still early days) plan to fix our housing crisis, and much more? We would like to think that we have played a role in this success, along with other groups we work with closely, like Generation Zero and Bike Auckland. The public conversations around transport and housing issues, while still frequently crap, are certainly generally better than they used to be. Politicians now have confidence to be pro-housing or pro-travel choice, knowing that both there’s a strong evidence base behind these positions as well as a pretty big bunch of potential voters. The other big change for Auckland has obviously been amalgamation. With one council, Auckland has been able to progress big projects like the City Rail Link or consistent and bold plans like the Unitary Plan. A large and powerful Council was also able to stand up to the previous Government in a way that would have been impossible before amalgamation, getting some major wins against the Government’s initial position, like the City Rail Link (and was well on the way towards winning support for light-rail). I certainly hope that the progress Auckland has made in recent years continues and accelerates over the next decade. While a lot has improved in recent years, Auckland is still a long way away from fixing its housing crisis and a very long way away from having a safe cycling network. A new road safety crisis has emerged in recent years that requires massive change to our transport system to make it safer. But I think we can be proud that we are, for the first time in a very long time, doing better than a lot of other cities. Auckland certainly is doing a lot better than it was – arguably not that hard a bar to climb over, as it was fairly atrocious – but I’d put the praise for that fair and square on the shoulders of those of you at Greater Auckland, and to a large extent, mostly on you Matt. You’re an absolute marvel – tirelessly fighting, sanely, hopefully, and intelligently, for a city I’d written off as beyond hope. I don’t think it will ever lead the world, but at least it is no longer at the bottom of the list. I second your comments on Matt and GA’s achievements in general. With a call-out to Josh Arbury who started TransportBlog. I do note that for all of the hard work we’ve done in the last 20 or so years, per capita we are barely back to where we were in the late ’80s, And that point was at the end of a long declines in PT use that started when they ripped out the tram lines in the ’50s. So if we get to your 2028 target, in reality we are back where we were with PT use in the mid to late 1960s. So for all the ambitious of these plans, we are really just getting to where we were. It will still be very impressive if we do get there, but somehow I think the logistics of making so many Aucklanders get out of their SOVs will become extremely hard to achieve unless significant change in how AT operates and allocates road space takes place, and takes place very soon. Auckland has a lovely natural setting, plus it benefits from NZ’s general loveliness and benign political environment. And it’s also true that Auckland’s PT system has, in the last 20 years, moved from atrocious to halfway OK. And perhaps it will move into the decent category in the next 10 years, if we’re to believe ATAP modelling (which I understand include road pricing?). The big challenge facing Auckland, however, is not transport but housing. Auckland is way more expensive to live in than comparable cities overseas. Until housing costs come down (both capital values and rents), I personally don’t think a lick of half-decent PT paint will do much. Even having a world-leading PT system wouldn’t surmount the downsides of housing costs, at least for me. I hope Auckland finds a way to build more housing. Until that happens Auckland is off my radar as a possible city to live in. Sadly. I agree Stu, what we have done so far with housing with the Unitary Plan etc is not enough. But there is momentum for reforms, the public is largely onside. I think Auckland needs to use the gains it has made in creating a rapid transit network to massively improve its housing supply. Stu did you see this Master Planning around transit stops proposal of mine? 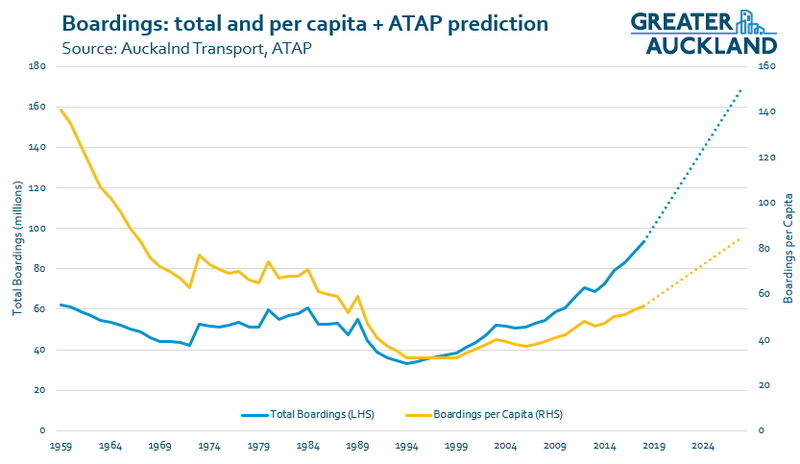 The Transit Boardings per Capita graph fro Auckland is fascinating – despite significant growth from the low point at around 1994-9, where we are now is still less than half the boardings per capita that we had in 1964! I would be interesting to have some commentary on this. 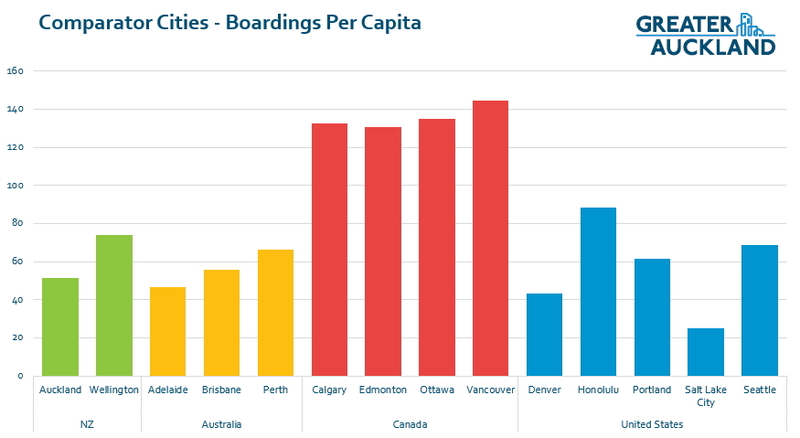 Especially as its not as if 1964 was the peak boardings per capita, the 5 years before that we had 20million more boarding per capita. Its taken us 20 years to claw back 20m boardings per capita that we lost in 5years! I imagine it is a combination of urban sprawl, motorway building and cars becoming increasingly more affordable. It’s a trend that happened in many places across the world but Auckland had a particularly big fall due to a complete focus on roads over PT. To summarise, in the 50s they decided that everyone should only drive for transport in the future, and systematically dismantled and shut down the extant public transport system, systematically set about widening all main roads and intersections for more car capacity, demolished houses and workplaces in urban settings to build carparks, and spent practically the entire transport budget on widening roads and motorways, and literally demolished inner city walkable-PT neighbourhoods to build the roads to serve remote suburban sprawl that was designed in such a way that driving was the only practical way to get around. The remaining fraction of user on PT were basically ‘welfare’ types who were too young, old, poor or otherwise unable to drive. This process ran from the mid 50s to the mid 70s, which is why you see the sustained nosedive in PT boardings per capita. They planned for exactly that, and stuck at it until they had achieved their plan. Great post that had me chuckling. Thanks Matt. Average Human and Greg are right that GA should be celebrating. I second Greg’s call for AT to urgently change how it allocates road space. The SH widening that NZTA is pushing ahead on, the 40 km of new road each year, the still overcooked plans for Mill Rd when we desperately need the money to be spent on alternatives – all this is heading us in the wrong direction. The road building and road widening must stop. And mitigation for all the induced traffic that is still accumulating from decades of road building must start in earnest. Traffic lanes must be given to cycling and buses and walking and trees. Roads with no general traffic lanes and one-way roads will probably be necessary in many places. Real people-flow can be achieved on the arterials with public transport and cycling, but rat-runs must be cut to ensure it doesn’t result in the local roads taking those SOV’s instead. The ridership numbers only show half the story. The other half is vkt, and I don’t see any plans to substantially reduce that. For the sake of safety, climate change and good urbanism, we must reduce it. Good point on VKT. And vehicle ownership too — I know many people in Auckland who would like to own fewer vehicles than they do. Which suggests to me general non-car accessibility (as defined by transport and land use) is still too low. Quite right Stu, the bench mark is not in the English speaking countries. Much of Europe has embraced public transport for many years and it is mostly based on good coverage, good frequency and affordable prices. Parts of South America also have outstanding public transport ridership in many cities because that is all people can afford. As the article posted by Matt on Midweek Reading suggests, if many Aucklanders chose public transport as their only way to move around the city it would probably leave them better off. Auckland may be doing well in comparison to some English-speaking anglo-saxon comparator cities, but this does not make “the world”; most of Europe has been pursuing progressive transit, walking and cycling agendas for as standard practice for a long period. many many years. Even the rate of turnaround isn’t especially amazing when compared to change of tack in Chinese cities. Yes, for example Amsterdam has a new metro line opening in 6 weeks’ time, which will be splendiferous. The Anglo world is being left behind in more ways than just transport; we’d be wise to find other benchmarks. Oh wow that line is finally opening? It’s seems like Amsterdam Centraal has been an eternal construction site every time i visit. Oh wow, construction started in 2002, lets hope our tram lines don’t suffer the same fate. Santiago, Chile, opened metro line 6 in November 2017, a 15km long underground line with driverless operation, platform doors etc etc. I think Auckland is a long way off being a world leader. Off-topic, sort of, but still part of the improvements needed for Auckland. There’s a new topic (traffic light phasing) added to an agenda for a meeting I have this afternoon. Can anyone tell me whether in Auckland we have bus recognition technology for buses in amongst general traffic? Or is the only way we can prioritise buses at intersections by putting them in bus lanes so the loops there send the information that a bus has arrived? Yes we have a bus recognition system. This can enter a green light by 20 seconds (I think) or bring forward the green phase by about the same amount. However it is only used when a bus is running behind schedule so it can catch up, it doesn’t make the schedule faster overal, i.e. it only gives a little bit of priority if a bus is already late. It also doesn’t work with a high frequency of buses, because there is always a bus at every signal anyway. Is there any reason it is only used when they are running late? This appears to be quite a useful little system that could help with bus speeds that most motorists wouldn’t even be aware was happening. Because then the bus arrives early and just sits there. Also, apparently it makes the system go haywire doing it too much. I’m told it got switched off in most places. That would amount to systematically prioritising buses over cars, I think that is the main issue. Ari: if they did that they could just adjust the schedule. It priorities roads that are bus routes over roads that aren’t. So (with a high frequency of buses) the relative throughput of the intersection changes from the designed one. This could lead to overflowing turn lanes, cars on side roads not able to join the arterial etc. So I can see why it could cause problems. Moving from the transport we have now to the transport we need for a good sustainable, liveable city will involve decisions that do this, all over the city. The logical next step will be people not wanting to be in those overflowing turning lanes, etc, and deciding to take the walk to the bus stop instead, to receive that priority. It’s just the necessary and logical re-balancing of an unbalanced network. I think the problem is more about travel time consistency. Can’t change the bus schedule if it is early only sometimes. As I understand it, the main problem with the system is that buses from competing directions break the system. Thanks, Nick. So at a local midblock crossing where a controller box has just been installed to reduce the pedestrian wait time (yay, AT), how would you interpret this comment: “Timing will vary during the day depending on how we decide to coordinate the lights. We will try to minimise delay to buses during the peaks and minimise delay to pedestrians the rest of the day.” From your comment about only using bus detection to get buses through if they’re late, do you think they just mean they will minimise delay to general traffic (including buses) during peaks? Just wondering about priority, given that pedestrian traffic in this location, including passengers swapping between frequent bus routes, is at its highest in the peaks as well. Actually I think you already answered it – this is on the 18 route, so buses are frequent, hence there will already be a bus at every signal. If they’re keen to minimise delays to buses, I’m not sure why they’re not putting in a bus lane. This report here is 10 years old but I think a lot is still applicable. Used the train this morning. Hope they’re going to have a HOP card top up machine on the platform side of the barrier as it was before. I was looking at the area under the ramp for secure bicycle storage at Papatoetoe station. The gate person in their little box will be looking right at it. The old storage shed could be moved to Puhinui Station to go with the cycle lanes on Puhinui road. The Green Party have spent a lot of time and energy pushing for these sort of gains too. MMP has undoubtedly allowed us to have richer political conversations which mean we can shift public attitudes generally even if that doesn’t necessarily produce a huge vote for the Greens. Any time we allow a more diverse set of voices to appear, we improve our conversations and get bold new ideas into the public agenda. For all their diversity, they still poured an intense amount of energy into a rail line to the North Shore. I wish they did as much lobbying for Light Rail for other, poorer parts of the city. A lot of energy maybe but achieved naught in achieving a north shore rail line. Now it seems the Greens are ignored as the NIMT electric network is soon mothballed and the EF fleet stood down and likely scrapped. Why is Auckland able to make such progress relative to other cities? Yes, Gen Zero and this blog must take some of the credit for keeping the public consciousness well-supplied with new and progressive PT ideas on an ongoing basis. But much though it goes against the grain, I’d suggest that the former National Government, which set up AT, must also be given some credit. If it hadn’t been for the local government amalgamation of 2010, we’d still have seven territorial local authorities and the ARC, all with their own agenda, often quite lacking in co-ordination, and no one with the mandate for an overall vision for transport in the region. Of course, it hurts to give National credit, and I’m sure many National supporters would not be comfortable with the accolade of having turned around PT decline in Auckland, but the truth is that most of this significant growth happened under their watch. One could argue despite them, not because of them. A lot of the current growth dates back to decisions made by the old ACC (building Britomart) and the old ARTA, pushing through and developing the rail network. Sure, but the funding (eg for Project Dart, Manukau branch) came from central government, which also legislated for PTOM. I’m still amazed that National actually did all this while being so openly sceptical about PT. Project Dart and Manukau were both begrudgingly funded by the Labour government. The success of AT and the National Government namely the CRL won’t be seen in growth numbers for quite a few years yet. The former was responsible for bus lanes (Central Connector etc) and Britomart, whereas the latter deserves credit for rail rolling stock upgrades, electrification, and integrated ticketing. Both councils were essential, but arguably the ARC was more important from 2004 onwards, as ACC’s PT efforts were increasingly stymied by the car-loving John Banks, who took over as mayor from Christine Fletcher (responsible for getting Britomart built). From around 2004 onwards the ARC time benefited from several PT-supportive councillors, such as Mike Lee, Joel Cayford, and Christine Rose. I understand these councillors worked to produce the 2005 Regional Land Transport Strategy. This was the document that leveraged Britomart’s legacy to plan for much wider PT network improvements, leading to things like the Rail Development Plan. While Cayford and Les have had their subsequent disagreements, there’s no doubt that they both of them deserve considerable credit for Auckland’s PT turnaround. Let’s finish the job they started! a lot of the rennaisance can be traced back to the Clark administration, Keys basically got lumbered with the Clark decisions, like the current one is lumbered with the ronps. No, the enthusiasm of the ARC predates the enthusiasm of the Clarke govt. ‘World Class rail network anchored by the CRL’ & Auckland leading the world… I am a big fan of this website, but this is too much….1st of April kind of stuff sorry..
Will it be possible, that the future Auckland rail network post CRL would still not allow Express trains ? A world class rail network where every train has to stop at every station ? Can you imagine a Swiss tourist taking a train from Papakura to Britomart, 30 kilometers in 60 long minutes in year 2022, getting off at his destination saying aloud : ‘God I wish we had this back home in Zurich, JAA !?! The Waiuku line i privately owned by GVR. About 25% of travel in the whole of Austria is by public transport, so there’s a long way to go to lead the world. The 140km between Hamilton and Auckland usually takes over 2hrs by bus and even longer by train. The 155km between Vienna and Linz takes as little as 1hr 6min by train and there are 4 per hour. Auckland’s going to take about a decade to catch up with Wellington and, to become a world leader, it needs more than even GA has yet suggested for speed, coverage and frequency. I’ve been on that train from Vienna to Linz, and it is a lovely route. Great scenery. But also, importantly, key destinations at each end, and much urban housing. Trouble with Auckland to Hamilton is that one end is a bit lacking in interest, urban housing, central work opportunities etc. I feel it would work as a commuter line into Auckland, but probably not much traffic the other direction, and so that affects the economics – every train is empty on the way back. That’s why a line to Tauranga makes so much sense. Not just commuters living in the Waikato travelling to Auckland, but also Aucklanders travelling to Hamilton *and* Aucklanders travelling to Tauranga (business, family, holiday, day trips), *and* Hamiltonians travelling to Tauranga *and* Taurangatans travelling to Hamilton and to Auckland. If you do the math, five stations from Hamilton to Auckland gives 20 possible pairs of origin and destination, of which 14 are anchored at one of the two main centre. Add in Morrinsville and Tauranga and you have seven station with 42 origin-destination pairs, of which 30 are anchored at one of the three main centres. That’s the network effect at work right there. A line to Tauranga makes no sense while it’s quicker to drive, which it almost always will be given the rail distance is longer than the road distance, the trains never go any faster than a car and the line is all single track clogged with freight trains. 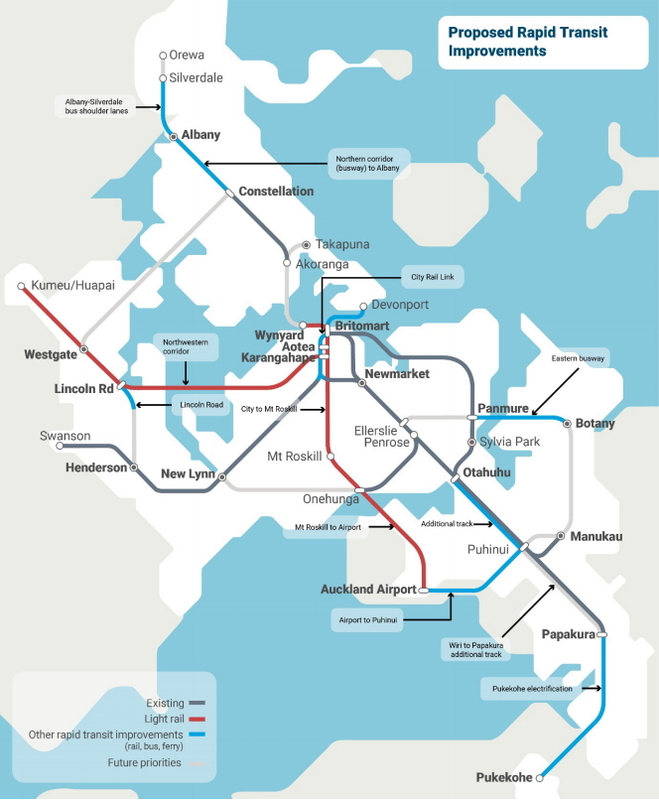 Concentrate on upgrading the Auckland-Hamilton corridor, that’s where rail will be competitive for commuter services. Except if you are leaving AKL on a friday and returning on Sunday when the motorway and half of SH2 is crawling. There are also 8 flghts daily between Auckland and Tauranga, flight time 40mins. Zippo you say it’s a 40min flight but have you allowed for the time it takes to get to the airport and the 30min’s+ before you an board and the time it takes to get out the other end ? In Europe, trains routinely do 200 km/hr or more for long distances, in NZ you’re lucky to get to 100 km/hr. I drive and fly between Auckland and Tauranga for business fairly often. Driving is hugely variable, minimum of three hours in practice, sometimes four or five with traffic. Same with flying, while the flight time is 40 minutes, I allow a minimum of three hours for downtown to downtown due to airport access rigmarole. Not much time saving but I don’t like to be behind the wheel for seven or eight hours in one day. In my opinion a train need only take three hours (an average of 80km/h) to be very competitive with driving and flying. That should be feasible with current conditions. If you invested and got the time down to around two and a half hours it would be a no brainer. Oh and another issue with the flight, the aircraft are quite small and only seat about 60 people. The peak routes sell out quickly and cost at least $300 each way. It’s often flat out impossible to get a seat on the day at all. A peak train would cost less to operate yet could carry up to ten times as many people, so tickets would be cheaper and seats more available. +1 Nick. Lots of people want to arrive more refreshed than driving can leave you. And able to write down your thoughts on the way back from a meeting, too. People who would choose to take a train to avoid the carbon emissions of flying are not few and far between either. The previous Kaimai Express took 3.5 hours for Auckland-Tauranga. Given absolutely nothing has changed between Papakura and Tauranga to increase train speeds and the congestion on the Auckland metro network, it would certainly be even longer now. The point about planes is they maybe only Q300s with 50 seats, but they leave at regular intervals throughout the day. One train a day is a guaranteed flop, it’s been proven over and over again, way too inflexible for most people compared with driving. Hey, I’ve got an idea. Why don’t we put the externalities associated with flying onto the price of the tickets? Brilliant! I agree, but the problem is a transport service catering for people who can’t afford cars or plane tickets mostly doesn’t get the numbers needed and tends to fail in NZ ie Manabus. Zippo, who said one train a day? I say one an hour at least. David, they were involved in the stop location choice and picked that location themselves. Slightly off topic, the graph on US PT usage closely corresponds with the price of oil. I believe because the US has very low fuel taxes any surge in the price of oil leads to a large increase (percentage-wise) at the pump. People then rush to PT, when the price drops they rush back the other way. Q: Can Auckland lead the world? Can Auckland lead “the world”? If that limitation’s a definition of “the world”; then yes I suppose it’s possible. Although the author must want to appreciate that Sydney’s PT ridership is also increasing and set to increase further with major infrastructure projects coming to fruition (the Metro and light rails’). And Perth and Melbourne have similar PT expansion’s planned. But if you want to use the general acceptance of the world; the answer sadly is a big NO. Auckland can just never come close to cities like Hong Kong, Kyoto, Madrid, Paris, etc….